"FUTURE TIMES X-TRA! X-TRA! READ ALL ABOUT IT! A new uprising is imminent in the battle to contain the Maverick Reploids that have broken away from their control center. Once believed to be completely contained, these Mavericks have been detected in an abandoned production factory, according to an intelligence report by well-known scientist Dr. Cain. A special armada of Mavericks Hunters was mobilized today to the production factory, but only one reploid has been able to penetrate the heavy artillery outside the factory. Known as Mega Man X, this same reploid had been primarily responsible for the apparent elimination of the threat six months ago. According to Dr. Cain's report, now Mega Man X will battle the Mavericks in an attempt to locate and destroy the leader of this new uprising." --From the SNES Mega Man X 2 instruction manual. Play Mega Man X 2 Now! This was one of our favorite Mega Man games. The graphics and the gameplay are great as always. Mega Man X 2 was a very popular game in its day but it was still a little tough for CC to find. I think we got lucky and found it at a flea market though. Capcom really knew what they were doing when they made this great title. 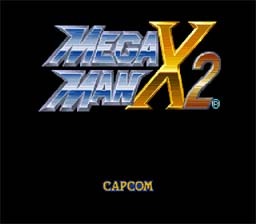 If you have been living under a rock for the last ten years and somehow managed not to play Mega Man X 2, I suggest you come out from there and give it a try. Classic Mega Man action! If you've never played a Mega Man game before, I'll give you a bit of a rundown. You must use your weapons to destroy the enemies, especially your main weapon, the Mega Buster, which you can charge up by holding down the shooting button. You'll eventually fight a boss, so you must use different battle strategies to overcome all! You can collect powerups, such as the ones that restore lost energy. Have fun!